...dedicated to increasing and diffusing the knowledge of acoustics and its practical applications. 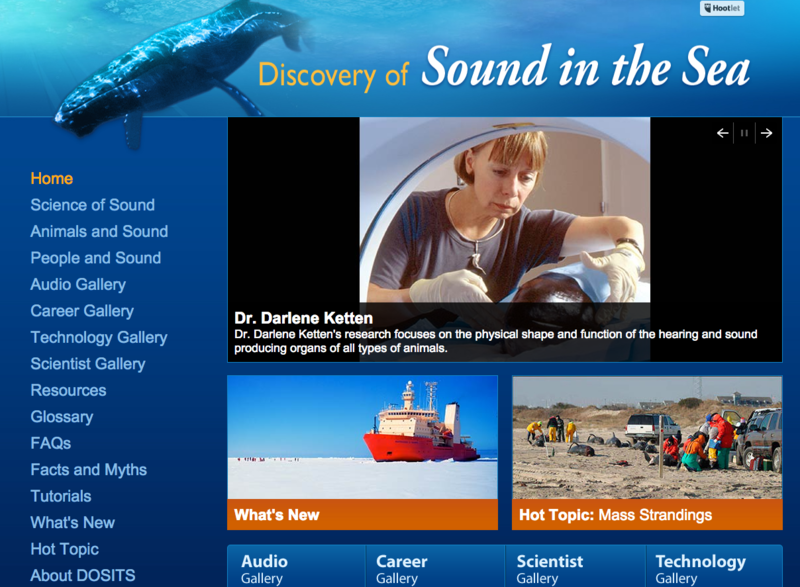 The Discovery of Sound in the Sea website will introduce you to the science and uses of Sound in the Sea. There are several major sections on the site such as The Science of Sound in the Sea, People and Sound in the Sea, and Animals and Sound in the Sea. You will find the site’s Audio Gallery a fascinating place to visit where you can listen to underwater sounds created by marine animals, human activities, and natural phenomena such as lightning, earthquakes, and rain. Check out the Technology Gallery and discover a variety of equipment that uses sound to investigate the ocean. Watch video interviews with scientists that study how marine animals produce and hear sounds. Investigate how scientists use underwater acoustics to track ocean currents, identify potential obstacles, and quantify fish distributions. There is also a special section for teachers with resources and classroom activities. It’s a Noisy Planet. Protect Their Hearing.® is a national public education campaign, developed by the National Institute on Deafness and Other Communication Disorders, part of the National Institutes of Health. 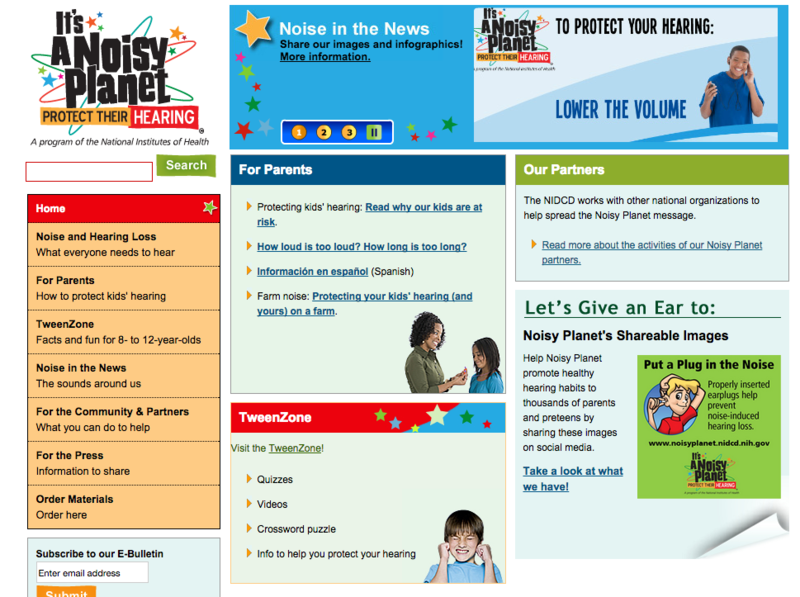 Noisy Planet is designed to increase awareness among parents of children ages 8 to 12 about the causes and prevention of noise-induced hearing loss (NIHL). With this information, parents and other adults can encourage children to adopt healthy hearing habits before and during the time that they develop listening, leisure, and working habits. The purpose of the International Commission for Acoustics (ICA) is to promote international development and collaboration in research, development, education, and standardization in all fields of acoustics. This is accomplished primarily by providing opportunities for the exchange of information and ideas among the various international acoustics communities. The most visible way in which the ICA carries out its mission is the convening of the triennial International Congress on Acoustics (also abbreviated ICA). 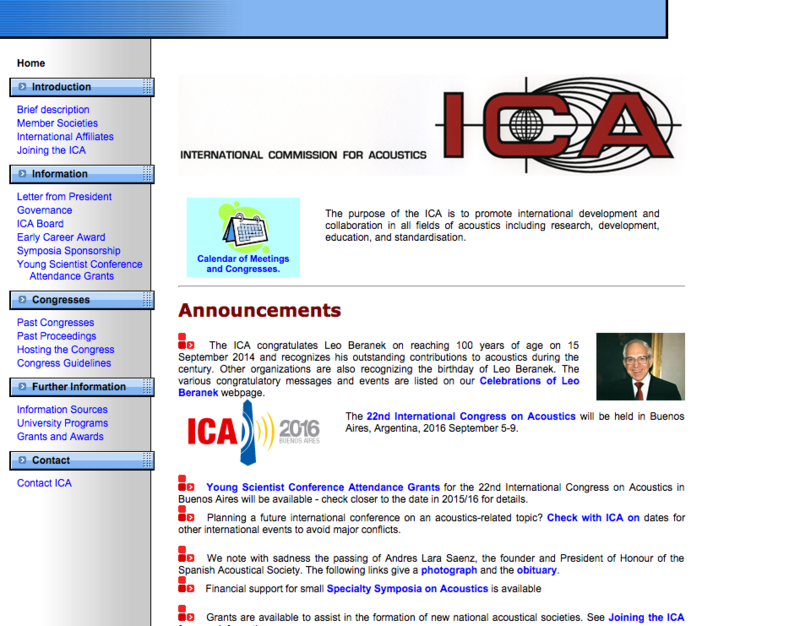 Additionally, the ICA (1) maintains close contacts with national and regional acoustical societies and associations and other relevant professional organizations, seeking consensus in matters of mutual interest when necessary, (2) provides an information service for societies and the many research and education organizations in the field of acoustics, (3) announces workshops, congresses, and symposia on acoustics, taking a proactive role in coordinating the main international meetings within acoustics, and (4) provides funding for the organization of international meetings and travel expenses for attendees.